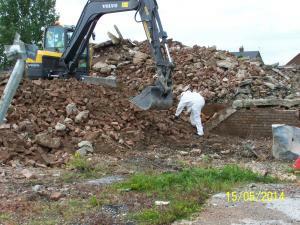 VertaseFLI was contracted by Wakefield and District Housing Limited through Environmental Consultant Robson Liddle, to undertake works to remediate asbestos impacted demolition. A former Public House constructed in part with Asbestos Contaminated Material (ACM) had suffered from demolition malpractice, resulting in a significant volume of demolition arising containing asbestos, which had been negligently used to backfill a cellar structure. Handpicking and disposal of visible asbestos fragments, breaking out concrete and excavation of underlying asbestos soil to facilitate the redevelopment, reuse of impacted soils under CL:AIRE Code of Practice, crushing and processing of hard materials. exercise was undertaken to remove surface ACM, prior to the excavation of impacted demolition arising. The ACM from the demolition arising was segregated and disposed of offsite. The handpicked demolition arising was screened, crushed, tested and used to create a suitable development platform for residential properties. measured on a full time basis and personal monitoring on numerous site workers was undertaken both within and external to the control zones. The remediation works were complicated by the fact that the ACM materials had been used to backfill a 4m deep cellar structure and the controlled excavation of this proved challenging, with access issues and constant dust suppression. In addition to the asbestos, the demolition malpractice also posed uncertainty over the presence of live services which had to be hand dug and identified prior to excavation works. 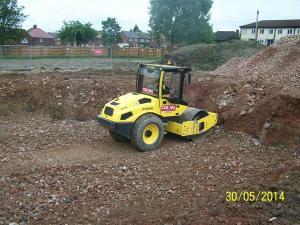 The works were completed and the site handed over to the client for redevelopment in a 6 week programme. Our clients can benefit from our extensive global knowledge and our network of contacts that we can call on as part of our wider delivery team for complex projects.